This dish has nothing to do with cats. It is a typical Napolitan dish and ‘Gatto’ is simply an Italianisation of the French Gateau. It is basically a potato timbale. 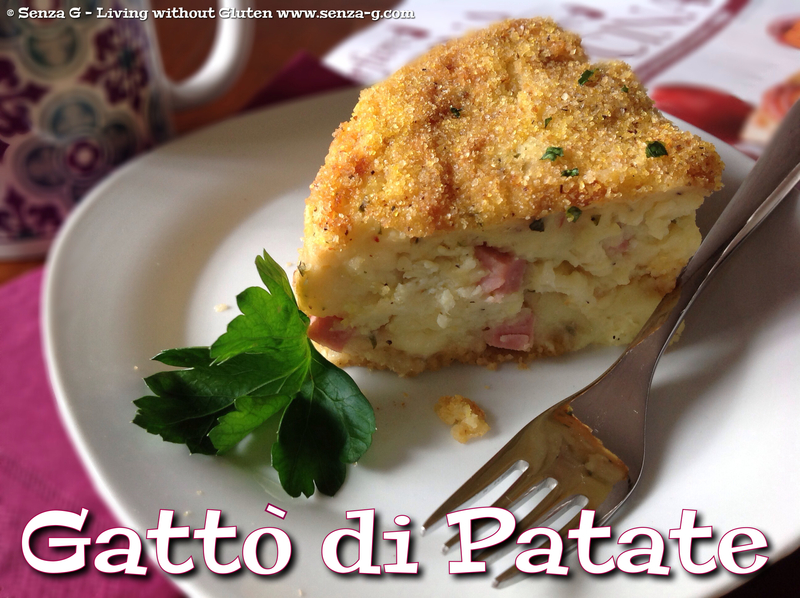 The traditional recipe is made with Provola affumicata, salami and scamorza. But there are so many different versions. Some make it layered and some with the ingredients combined all together. I made mine with cubed prosciutto cotto, bacon, stracchino, mozzarella and parmesan. You can put in whatever combination you like. Put the potatoes and whole peeled garlic to boil. Boil till very soft. In the meantime, place the bacon under the grill to crisp. When ready, crumble. Mash the potatoes with the garlic, adding two tablespoons of butter. Add the beaten eggs and mix. Add the cheeses, the prosciutto and bacon. Season with salt, pepper and nutmeg. Combine the breadcrumbs, polenta and extra grated cheese. Grease a 18cm spring release pan, and sprinkle the bottom and sides with the breadcrumb mix. Leave some for the top. Pour the potato mix and level. Sprinkle the top with the remaining breadcrumb mix. Place little pats of butter all around the top. Place in the oven and bake for about 40 to 45 minutes or until the top starts turning golden. Leave to set for 10 minutes. Run a knife around the sides. Release it from the pan gently and place on serving dish.